Sports auctions are fantastic ways to raise money for charity. Professional sports teams are widely followed by fans across the country. They’re always engaging with fans in new and creative ways so they can generate new fans, and continue to delight their current ones. One great way for sports teams to engage with and create new supporters is to host a sports auction. These auctions take signed memorabilia, game-worn jerseys, and other items, and sell them to raise money for a local charity or non-profit. It’s a great way for the sports team to give back and support the local community, and it presents a unique opportunity for a fan to support their team. 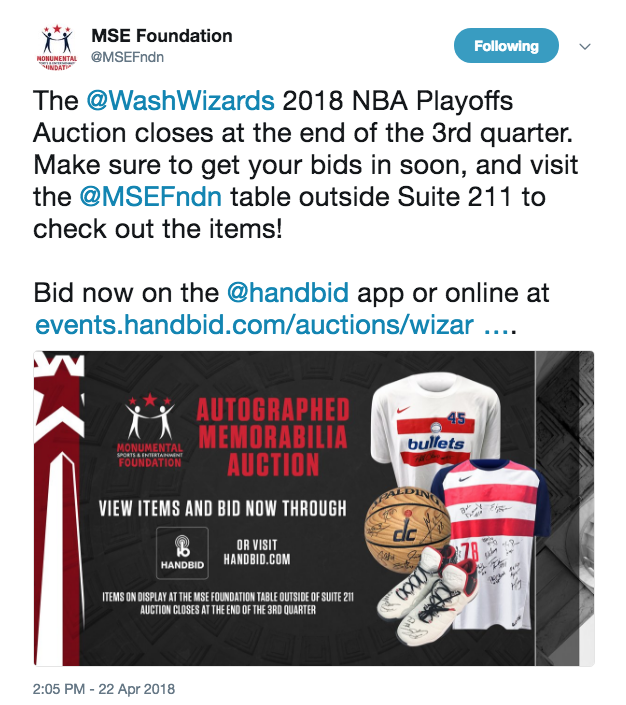 Handbid has helped some pretty well-known sports teams for their silent auction needs. The San Antonio Spurs, Sacramento Kings, Denver Broncos, Washington Capitals, and other sports teams have all used (and continue to use) our software. It’s an app that makes it easy to auction sports memorabilia. 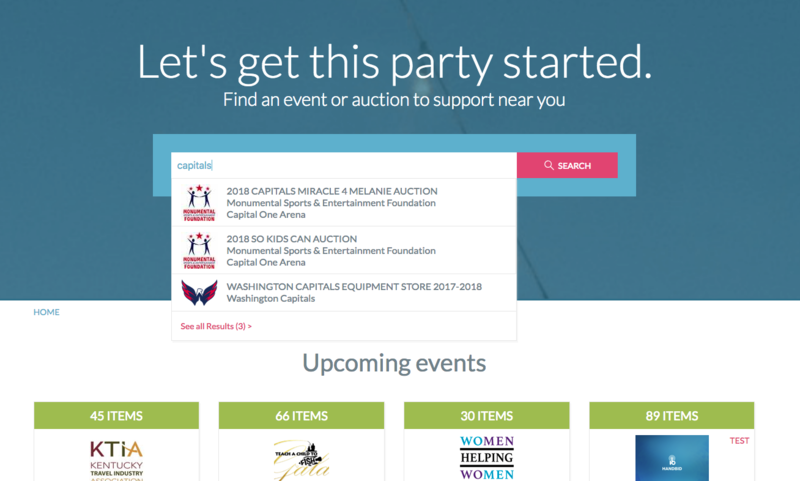 This means all of Handbid’s auctions are available for anyone to find, even if they aren’t at the event! They only need to go to events.handbid.com. This makes it incredibly easy to host fundraisers and for people to find them. For example, some organizations that we’ve worked with in the past will host a silent auction right after or during games so fans can bid on authentic, game-worn gear. Making all auctions visible allows people to easily find them, including the guests who weren’t invited to bid! If an organization pushes out a cryptic URL and the user forgets it, that won’t matter on Handbid. The user can simply open their app on their smartphone or tablet and start bidding again. Handbid has a built-in invite system that makes it easy for auction managers to generate an invite list and push out a new auction invite to them. 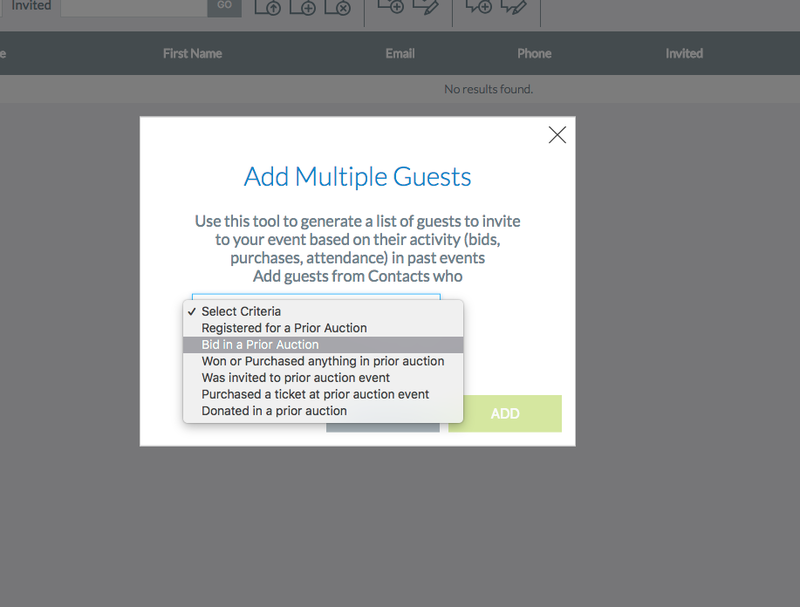 The Handbid Guest List Invite system makes it easy for managers to create a list of invitees based on past data. For example, managers can pull a list of all contacts who had bid in a prior auction, registered, were invited, or if they purchased something in a prior auction. Once that list is created, managers can send customized invites to those guests via email or text message. The invitation will have a link for each person that will automatically log them into the new auction or send them to a registration form if they are a new bidder to Handbid. This process makes it easy for managers to quickly establish a new set of bidders for their auctions. Handbid allows managers to easily share auction data or content via social media. All of the auctions and items within them have share buttons that automatically generate a specialized link that the manager can use to share content on their social media accounts. From within the Handbid app, managers can share the auction or item on platforms like Facebook, Twitter, LinkedIn, and Pinterest. Utilizing an online mobile bidding platform with simple-to-use invitations and sharing features should be considered by nearly all managers of sports teams and organizations with fundraising objectives. Handbid allows bidding managers to run multiple auctions to a broad audience. Our software is easy to use for both auction managers and bidders, and makes silent auctions much easier to manage, and our pricing options are much more cost-effective than the “per auction” rates most mobile bidding companies offer. Most importantly, Handbid has a history of helping non-profits and charities of all shapes and sizes. We can help you simplify your silent auction while also increasing the funds raised during your auction. Ready to learn more? Read more about our capabilities and experience our website, or see what auctions are currently live.